Be sure to have this on your calendar: On Saturday, September 16, 2017, around 10 am, Gideon Haimovitz will be doing his shodan (first degree black belt) exam. The exam is during Craig Fife Sensei’s seminar, September 15 – 17, 2017. 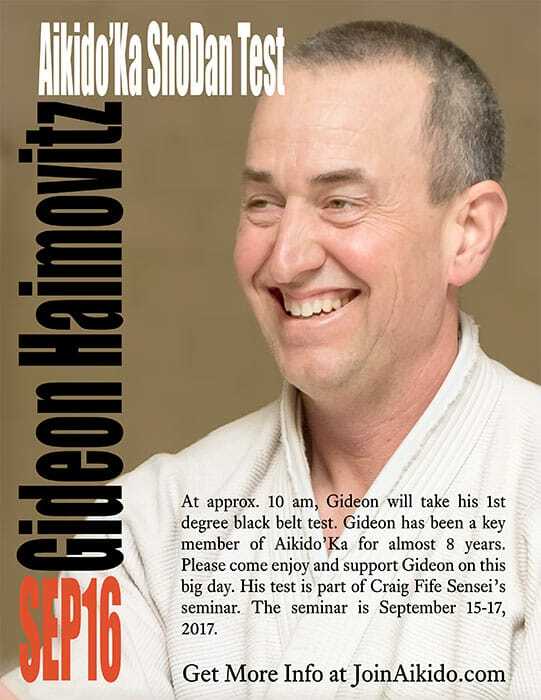 Gideon is a long-time student of Aikido’Ka, going on 7 years. Everyone who knows Gideon thinks the world of him and he’s immense fun to train with. His exam will be amazing. Gideon is the third home-grown black belt for me, after Gabriel Cuppet and Ian Isbell. Both Gabriel and Ian did amazing tests. I expect Gideon’s to be the best yet. Everyone is welcome to watch, at no charge. If you want to train during the seminar (which you really ought to do! ), click here to register.